Matt Light sure does like to do appearances at retail stores. Or maybe it's just my imagination. He did one about 6 months ago (here) and now he's got another one coming up tomorrow. The event starts at 5:30pm on May 8th. Click (here) for a craigslist listing that has more information if you don't feel like maximizing the picture and reading the small lettering. 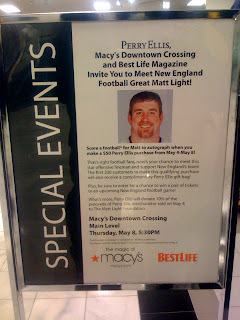 0 Response to "Matt Light @ Macy's in Downtown Crossing - 5/8"